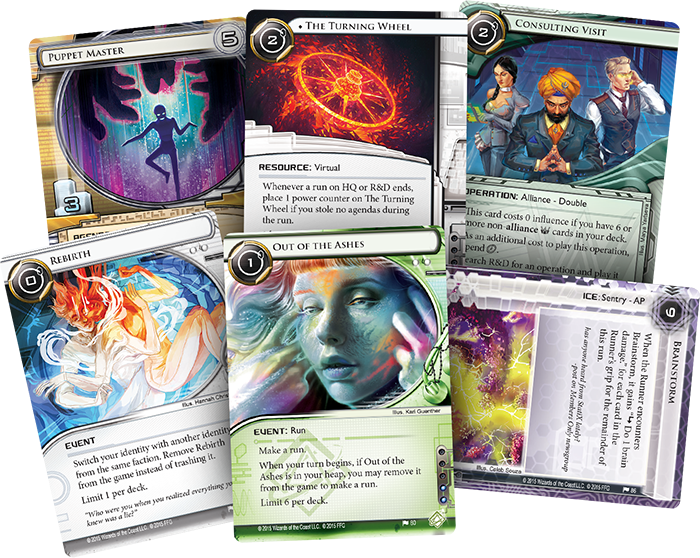 Let the mind games begin: The Liberated Mind Data Pack is now available for Android: Netrunner! 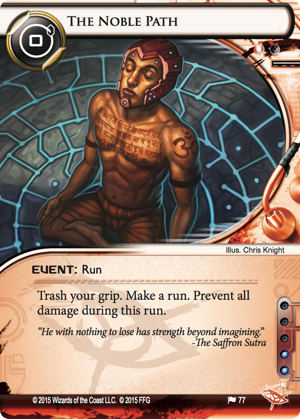 With its sixty new cards (including a complete playset of nineteen different cards), The Liberated Mind explores the unique confluence of traditional Indian cultures and virtual reality taking place within the streets, temples, and corporate divisions of Mumbad. Will you expand your consciousness under the advisement of Guru Davinder (The Liberated Mind, 84) and the Temple of the Liberated Mind? 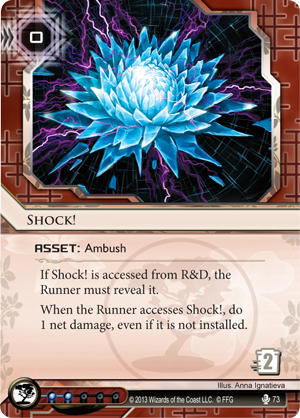 Will you delve further into the secrets of telepathy and the unique defenses they allow Jinteki to develop? The Liberated Mind brings all the Network's most transcendent qualities to the fore. Life, death, and rebirth—you can find them all among the dizzying array of virtual realities made available on the Network. 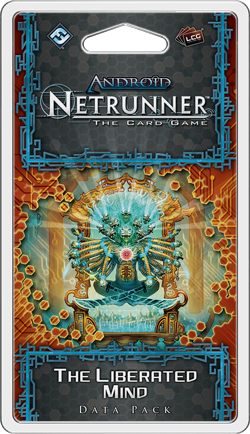 At its core, Android: Netrunner is a game about cybercrime. The elite, individualistic hackers known as Runners conduct raids upon Corporate servers, hoping to bypass all the best security that credits can buy in order to steal valuable data. Still, they come to these runs from a wide range of different motives. Some are in it simply to make a credit. Some see their runs as personal challenges or art. Some run because they hate the Corps and want to tear them apart. And some run for nobler causes—perhaps to help others, to discover hidden truths, or to unlock and disseminate the secrets to healthy living that Corps won't share freely. Still, even those who run to help others are transforming themselves into criminals. They're breaking the laws and treading a fine line between vigilantism and terrorism. 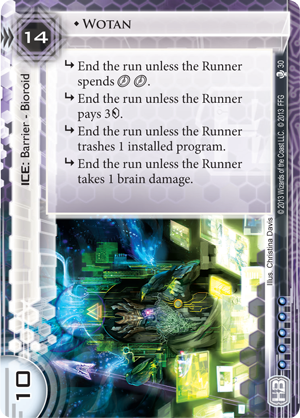 In The Liberated Mind, we find new options for these nobler Runners, including the new Anarch event, The Noble Path (The Liberated Mind, 77). By divesting themselves of all other trappings, the Runners who pursue The Noble Path gain freedom from all damage they might suffer during their runs. 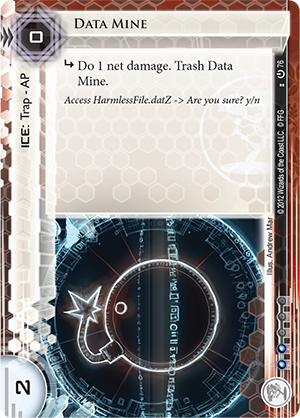 The purity of their approach allows them to ignore such potent ice as Komainu (Honor and Profit, 17) and Janus 1.0 (What Lies Ahead, 12), as well as traps like Data Mine (Core Set, 76). It also allows them to ignore the damage they would otherwise suffer from such assets and upgrades as Snare! 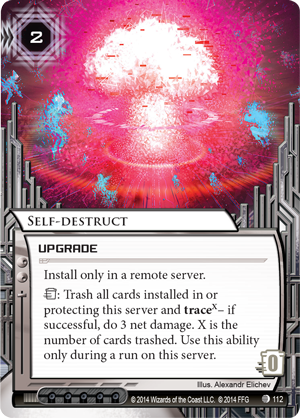 (Core Set, 70) and Self-destruct (The Source, 112). 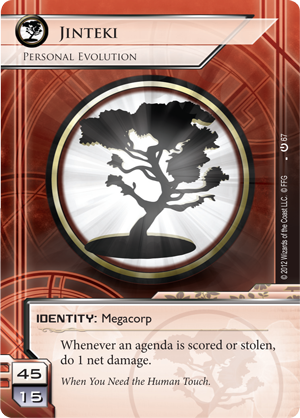 It even offers protection from the damage the Corp players would hope to deal with Jinteki: Personal Evolution (Core Set, 67). 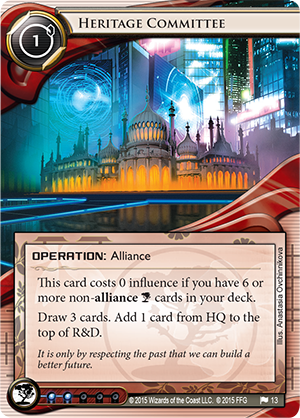 Altogether, this means that their pursuit of The Noble Path may allow some of the game's nobler Runners to launch powerful, late-game runs that go deep into a Corp's fully protected R&D. 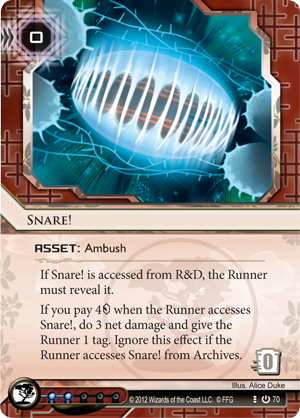 Historically, Corps like Jinteki don't mind too much if you can access five cards from R&D in one fell swoop because it likely means you'll flatline along the way, but while you're following The Noble Path, there's no number of Snare! or Shock! (True Colors, 63) that can stop you. The Runners aren't the only ones seeking to expand their consciousnesses in The Liberated Mind. Despite the contentious tenor of the Indian Union's heated national election season and the political controversy surrounding the Clone Rights movement, Jinteki continues at full speed with its research into the limits of the human (or clone) mind, gaining the use of two new psi cards, Chetana (The Liberated Mind, 89) and Dedicated Neural Net (The Liberated Mind, 88). 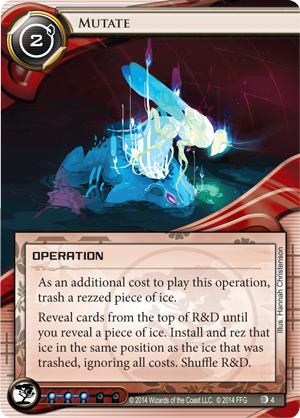 Although it doesn't end the run with either of its subroutines, Chetana may still manage to end some early runs against your early Jinteki: Personal Evolution decks. Play the psi game correctly, and you'll strip the Runner of cards, meaning if he or she were to access an agenda, the net damage your identity would cause would prove lethal. 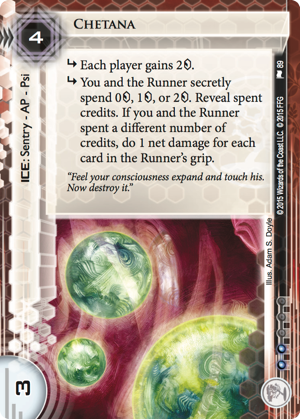 Accordingly, the Runner is likely to jack out before accessing cards in that situation. Chetana may not play as well in the late game. 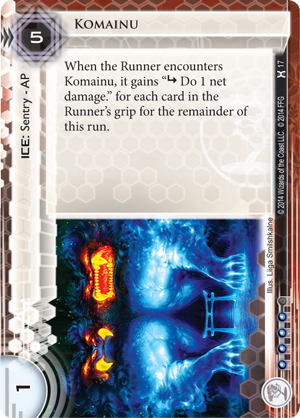 It is, after all, only a three-strength sentry, but because it's a piece of Jinteki ice, it can always Mutate (Upstalk, 4). 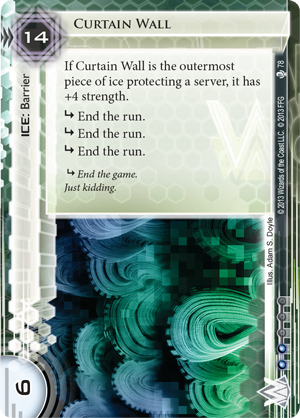 Since Jinteki is so closely aligned with constant evolution, you may find your early-game Chetana could become a late-game Curtain Wall (True Colors, 78) or Wotan (Second Thoughts, 30). And you can always speed the process along with your Heritage Committee (Kala Ghoda, 13). Of course, you could just leave your Chetana rezzed in front of your HQ and let the Runner through. 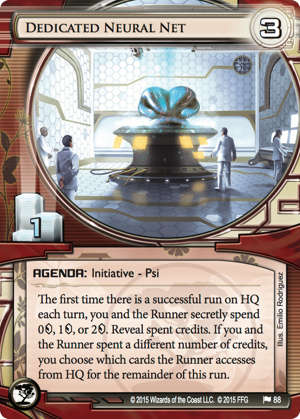 Unless the Runner pays to break the first subroutine, you'll gain two credits, and then if you've managed to score a Dedicated Neural Net, you can simply win a psi game to steer the Runner into your Snare!. Even if you don't have a Snare! in hand, you can make sure the Runner simply accesses your ice or operations, not your agendas. Expand your consciousness. 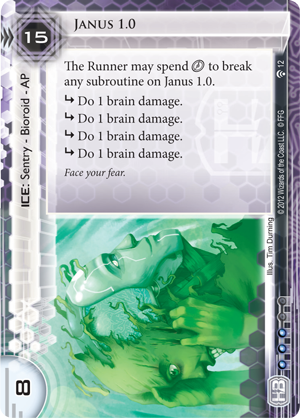 View the cyberstruggles of Android: Netrunner in a new light. The Liberated Mind is now available at retailers in the United States and online through our webstore. Availability in other regions may vary.